Mark had one-on-one interviews with Presidents Bush (41) and Clinton during his TV anchor/reporter days. 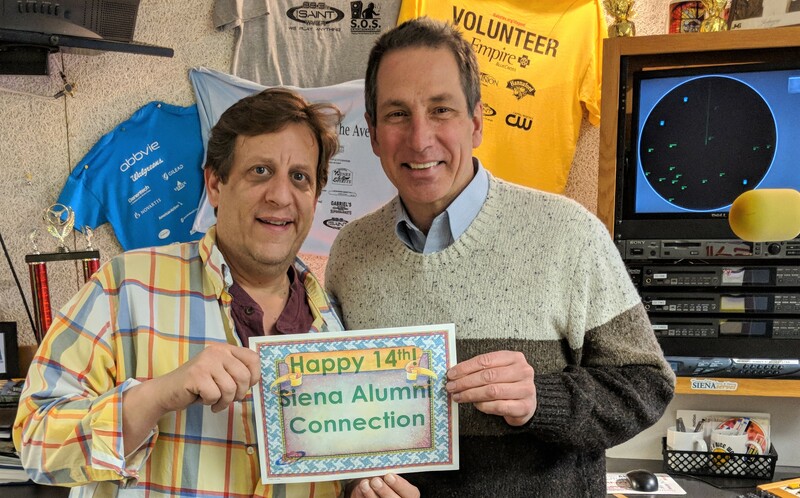 The Siena Alumni Connection radio interview program marks its 14th anniversary the week of March 20, 2018. The half-hour show with volunteer host Siena grad Mark Grimm is a one-of-a-kind program with remarkable stories about the lives and deeds of Siena alums, faculty and friends. More than 1,000 guests have been on the show, including dozens of CEO's, two Congressmen, an Olympic Gold medalist, a national TV news corespondent, five Siena presidents, eight head Siena hoop coaches and two broadcast Hall of Famers. "I'm so grateful to all the guests, management and production, and other hosts who have contributed to the show's amazing growth," said Grimm. "It is truly an unique program." The program airs each Friday at 4:30 pm on FM 88.3 The Saint, Siena's 35-thousand watt powerhouse. It also airs at that time on wvcr.com and on the iHeart radio app. If you have a suggestion for a guest, contact Mark at mark@markgrimm.com.